It's easy for David Farmer to get lost in the shadows. They are plentiful and expansive for the Hawaii running back. First there's that of his father of the same name. He played fullback for USC and briefly in the NFL. His uncle, George, and cousin, Danny, also played in the NFL. Also, Jazen Anderson, brother of former Falcons great Jamal Anderson, and Nate Ilaoa, one of the most talented and popular players on the UH roster, are among Farmer's competitors for playing time in the Warriors' one-back offense in the fall (in Ilaoa's case, pending the outcome of his petition to the NCAA for another year of eligibility). But the biggest shadows this spring are cast by 300-pound converted nose tackles Reagan Mauia and Siave Seti. Both are now running backs. The 6-foot, 230-pound Farmer laughed yesterday after practice when it was suggested he might switch to nose tackle. The sophomore from Santa Cruz, Calif., thought he'd proven he could be the main big back after playing in 11 games last year. He ran for just 49 yards on 12 carries, but excelled at the priority job of keeping opponents off quarterback Colt Brennan. But coach June Jones decided to experiment with Mauia, and now Seti, on offense. All Farmer can do is keep plugging away. "We'll let the depth chart sort itself out. There are no grudges. Even if I'm not the man, I'll just work as hard as I can to be the best back I can," Farmer said. "I've been here three years and was always at the bottom but able to rise above it. So now none of that even matters." Farmer is the go-to guy for information on how to play running back in the UH offense, Mauia said. "That kid knows the playbook like the back of his hand. He knows his stuff," Mauia said. "We don't have any animosity or anything like that. We just try to help each other out. Not one back's going to be in there all four quarters. So if you want to have a good rotation you help each other out." Running backs coach Mouse Davis counts on Farmer, in practice and games. "David is one you can rely on. He knows what's going on and he does a good job of helping the new ones. He did a great job for us last year as a reliable blocker. He's not one you feature as a runner, but he can do well because he knows what he's doing," Davis said. "You gotta have that kind of guy who comes to work every day and does his job. That's what he's doing, no doubt about it." Jones said he expects Farmer will play meaningful downs again this season. "He's smart and competitive. He's probably not as talented as some of the other guys," Jones said. "But that doesn't matter because he knows what to do and he does it." 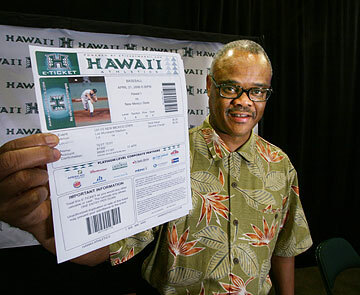 Hawaii athletic director Herman Frazier showed what a ticket will look like when printed on a computer. UH unveiled its new digital ticketing system yesterday, and tickets can be printed out on home and office computers by going to hawaiiathletics.com and following the directions. Athletic director Herman Frazier said the upgrade will cost $321,500 but save the department money in the long run through better customer service. Aloha Stadium interim manager Kenny Lum said his entity is paying $307,000 to improve its computer system and make it compatible with the UH upgrade (and is sharing in the upgrade cost). He said he hopes to also be able to use it for other Aloha Stadium events, including the Pro Bowl.